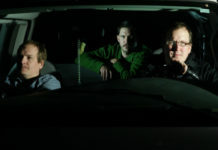 Cursive has just released a video for "Drunken Birds," viewable below. It's from their new album I Am Gemini, out now via Saddle Creek. Cursive has unveiled another new track from their upcoming full-length I Am Gemini, due out February 21 via Saddle Creek. Check out "Wowowow" below. Check out a new Cursive song titled "The Sun And The Moon" streaming here. I Am Gemini will be released Feb 21.